Over four decades, we’ve lowered barriers to development with developer tooling, enterprise integration, DevOps, PaaS, and SaaS. Today, serverless offerings from Functions and Logic Apps to Azure DevOps and IoT Central remove friction for development in the cloud. 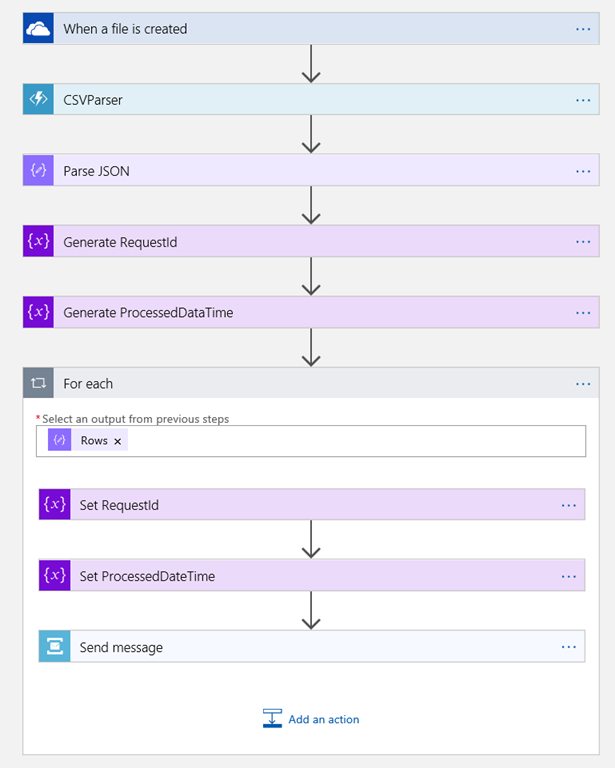 This morning, we’re excited to announce the initial release of the Azure Blockchain Development Kit which is built on Microsoft’s serverless technologies and seamlessly integrates blockchain with the best of Microsoft and third-party SaaS. This kit extends the capabilities of our blockchain developer templates and Azure Blockchain Workbench, which incorporates Azure services for key management, off-chain identity and data, monitoring, and messaging APIs into a reference architecture that can be used to rapidly build blockchain-based applications. These tools have become the first step for many organizations on their journey to re-invent the way they do business. Apps have been built for everything from democratizing supply chain financing in Nigeria to securing the food supply in the UK, but as patterns emerged across use cases, our teams identified new ways for Microsoft to help developers go farther, faster. This initial release prioritizes capabilities related to three key themes: connecting interfaces, integrating data and systems, and deploying smart contracts and blockchain networks. To deliver end to end blockchain solutions for consortiums, developers need to enable organizations, people, and devices to connect to the blockchain and do it from a heterogenous set of user interfaces. Take for example an end to end supply chain for a commodity such as cocoa. SMS and voice interfaces enable small hold farmers in Africa to transact and track their goods at the first mile of the supply chain. Internet of Things (IoT) devices deliver sensor data to track the conditions of the goods at different points in their journey to market – tracking the humidity in the containers where the beans are held to the temperature of the end product of ice cream that it is incorporated into. Mobile clients enable logistics providers to accept and transfer responsibility for products on their journey from manufacturer to retail using the compute power that already exists in the pockets of its employees. Mobile devices also have sensors such as GPS and cameras that can add complementary data that can help attest to the what, where, and when of deliveries. Backend Systems and Data in the form of ERP systems such as Dynamics and SAP are used to manage core processes for different participants. These systems also become clients via extension and need to interact with smart contracts to provide and receive attestable data on behalf of an organization. Bots and assistants enable manufacturers and retailers to interact with the supply chain. This includes interacting with smart contracts for orders and provenance using natural language and using attestable data from the blockchain to direct actions taken on behalf of a user. The Azure Blockchain Development Kit includes samples for all of these scenarios, including inbound and outbound SMS, IVR, IoT Hub and IoT Central, Xamarin mobile client for iOS and Android, Dynamics integration via Common Data Service (CDS), bots and assistants (Cortana, Alexa, Google Assistant) and web UX. Businesses are using blockchain and smart contracts to facilitate multi-party processes. Blockchain also delivers real-time transparency of the states and events of those contracts to appropriate participants. End to end blockchain solutions require integration with data, software, and media that live “off chain”. External updates and events can trigger actions on smart contracts. Smart contract events and state changes can then trigger actions and data updates to “off chain” systems and data. These external systems and AI will also need the ability to query attestable data from smart contracts to inform action. Documents and Media: Documents and media do not belong on chain, but business processes often involve images, videos, audio, Office documents, CAD files for 3D printers or other file types. The common pattern is to generate a unique hash of the media and the metadata that describes it. Those hashes are then placed on a public or private chain. If authenticity of a file is ever questioned, the “off chain” files can be re-hashed at a later time and that hash is compared to the “on chain” hash stored on the blockchain. If the hashes match, the document is authentic, but if so much as a pixel of an image or letter in a document is changed, the hashes will not match and this will make obvious that tampering has occurred. 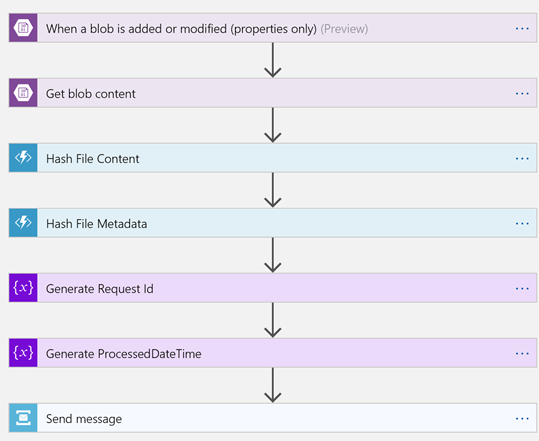 Today we’re releasing a set of Logic Apps that enable the hashing of files and file related metadata. Also included are smart contracts for files and a file registry to store the hashes on chain. Logic Apps have been created to deliver this functionality for files added to the most popular sources for documents and media, including Azure Storage, OneDrive, One Drive for Business, SharePoint, Box, Adobe Creative Cloud, and FTP. Smart Contract Interaction: Getting blockchain off the whiteboard and into production means dealing with the realities of how counterparties interact today. That reality is that Enterprise integration is messy. Microsoft brings our decades of experience in this area to blockchain. Our work with integrating Enterprise systems began almost two decades ago with the introduction of BizTalk server, and our focus on database integration traces back to our co-development of Open Database Connectivity (ODBC) in the 1990s. All of our experience has been captured and made available in Azure services. This includes 200+ connectors available in Logic Apps and Flow, and the robust capabilities in our data platform. Legacy applications and protocols – Sending and receiving files via FTP, processing comma separated files and email delivery of data. Data – SQL, Azure Search, Excel, and PowerBI. SaaS – SharePoint, Dynamics, Outlook, and Gmail. Registries – An accelerator that generates a custom registry and registry item smart contracts to accommodate any scenario. Today, we are also announcing that we will release a set of Logic App and Flow Connectors to extend these samples to ledgers like Ethereum, Corda, Bitcoin, and others. The Ethereum blockchain connector is available today and enables users to deploy contracts, call contract actions, read contract state and trigger other Logic Apps based on events from the ledger. With the mainstreaming of blockchain technology in enterprise software development, organizations are asking for guidance on how to deliver DevOps for smart contracts and blockchain projects. My business logic and data schema for that logic is reflected in smart contracts. Smart contracts are written in languages I’m less familiar with like Solidity for Ethereum, and Kotlin for Corda, or Go for Hyperledger Fabric. What tools can I use to develop those in? How do I do unit testing and debugging on smart contracts? Many blockchain scenarios reflect multi-party transactions and business workflows. These workflows include signed transactions from multiple parties happening in specific sequences. How do I think about data for test environments in that context? Smart contracts are deployed to the blockchain, which is immutable. How do I need to think about things such as infrastructure as code, local dev/test, upgrading contracts, etc.? Blockchain is a data technology shared across multiple organizations in a consortium, what are the impacts on source code control, build and release pipelines in a global, multi-party environment? While there are some nuances to the approach, the good news is that just like other types of solution development, this model can readily be addressed in a DevOps model. Complementing the whitepaper is an implementation guide, available through the Azure Blockchain Development Kit, that shows how to implement CI/CD for smart contracts and infrastructure as code using Visual Studio Code, GitHub, Azure DevOps and OSS from Truffle. 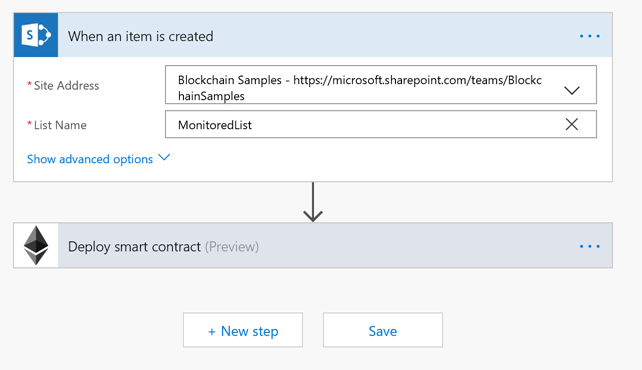 The Azure Blockchain Development Kit is the next step in our journey to make developing end to end blockchain applications accessible, fast, and affordable to anyone with an idea. It is built atop our investments in blockchain and connects to the compute, data, messaging, and integration services available in both Azure and the broader Microsoft Cloud to provide a robust palette for a developer to realize their vision. Logic Apps and Flow deliver a graphical design environment with more than 200 connectors dramatically simplifying the development of end to end blockchain solutions, and Azure Functions enable the rapid integration of custom code. A serverless approach also reduces costs and management overhead. With no VMs to manage, built-in scalability, and an approachable pricing model the Azure Blockchain Development Kit is within reach of every developer – from enthusiasts to ISVs to enterprises. Solutions are written using online visual workflow designers and Visual Studio Code, a free download that provides an integrated development environment on Windows, Mac, and Linux. 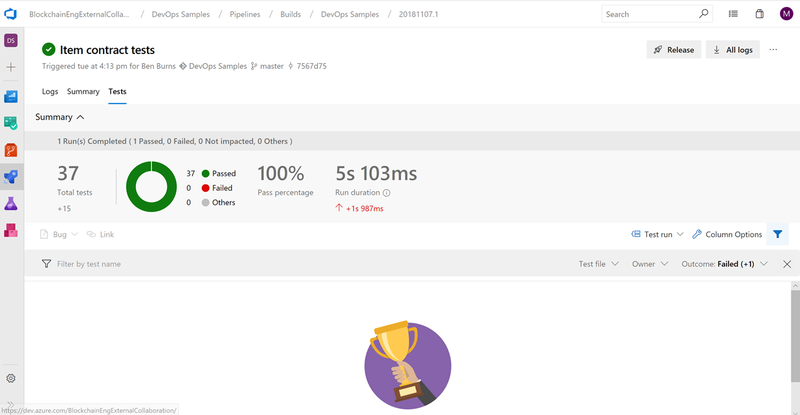 The resulting applications will run atop a network that has higher rated cloud performance than other large-scale providers and enable federating identities between participants using Azure Active Directory. With Azure, those applications can be deployed to more regions than any other cloud provider and benefit from more certifications. We look forward to seeing what you’ll build, and we’ll continue to both listen and look for ways to help as we build a decentralized future together. To learn more about how to use these samples to build and extend blockchain applications, you can find a host of videos on our Channel 9 show Block Talk. You can also stay up to date with the latest updates from Azure Blockchain by following us on Twitter @MSFTBlockchain.